Amyloid self‐assembly is linked to the pathogenesis of Alzheimer‘s disease (AD) and type 2 diabetes (T2D). Aβ40(42) is the main component of amyloid plaques in AD while islet amyloid polypeptide (IAPP) is the main component of pancreatic amyloid in T2D. Therefore blocking amyloidogenesis of the key amyloid polypeptides of AD and T2D is a promising therapeutic approach. 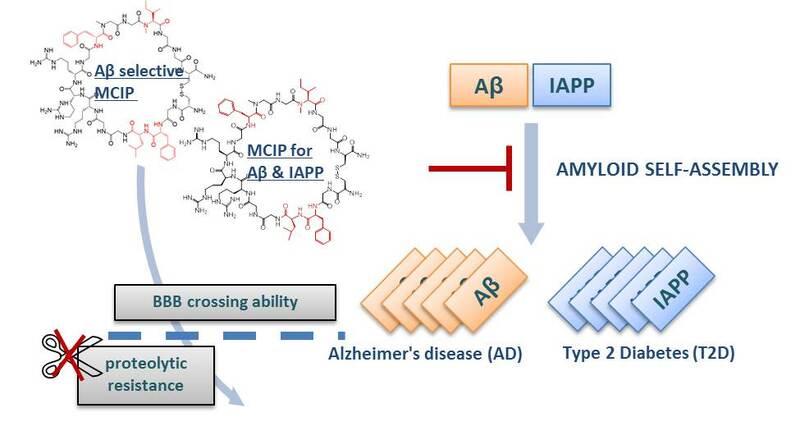 However, so far the successful design of anti‐amyloid compounds is hampered by several challenges including low proteolytic stability, low blood–brain barrier (BBB) permeability and high conformational flexibility. Thus, there is an urgent need to develop novel classes of amyloid inhibitors and exploit the therapeutic potential of blocking amyloidogenesis and related cell degeneration. Owing to their favorable properties, MCIPs are promising candidates/leads for macrocyclic peptide‐based anti‐amyloid drugs and scaffolds for the design of small‐molecule peptidomimetics for targeting amyloidogenesis in AD or in both AD and T2D. Proof of concept of lead compound in vitro and in ex vivo electrophysiological studies in mouse brains. Angew Chem Int Ed Engl. 2018 Jun 16. doi: 10.1002/anie.201802979.